Performance luxury brand Canada Goose reported last week that it will be opening six new stores later this year. Two are in Europe, one in the United States and three are in Canada. The new stores highlight the increasing demand both at home and internationally for the brand. Canada Goose will open its first store in Italy on Via della Spiga, one of the most sophisticated streets in Milan's Fashion District. Featuring an Arctic-inspired mid-century environment, the store will combine design elements of both Canadian and Italian heritage. In Paris, the new store will be located on rue St. Honoré, home to the world's most exclusive boutiques. In the U.S., Canada Goose will open its fifth location in Minneapolis, Minnesota at Mall of America. Each of these stores will feature a 'Cold Room', the brand's immersive shopping experience that brings the outside indoors, where shoppers can test out Canada Goose products in the environments for which they were created. In Canada, the brand will open three new locations. Its second Toronto location will be at CF Sherway Gardens in the Etobicoke area. In Alberta, Canada Goose will open a new store in West Edmonton Mall, which will also include a 'Cold Room' and the company will open at Cascade Shops in Banff. The new stores will showcase the full assortment of the brand's outerwear, knitwear and accessories, as well as seasonal collections and collaborations. 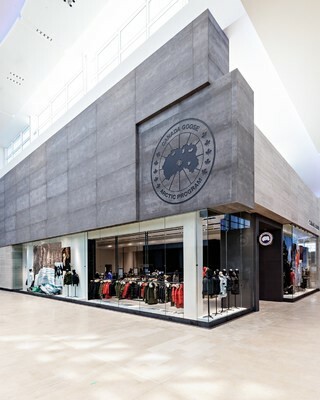 Canada Goose currently operates eleven company stores across three continents.